On the 11th of February, Michigan became the 38th state to permit the use a suppressor while hunting. The change became effective on the 11th. The restrictions related to the amount of noise reduction and use with subsonic ammo were removed at the last minutes by amendment. You can now hunt in Michigan with a suppressor and subsonic ammo. Suppressors are now legal in 41 states and legal for hunting in 38 of those states. 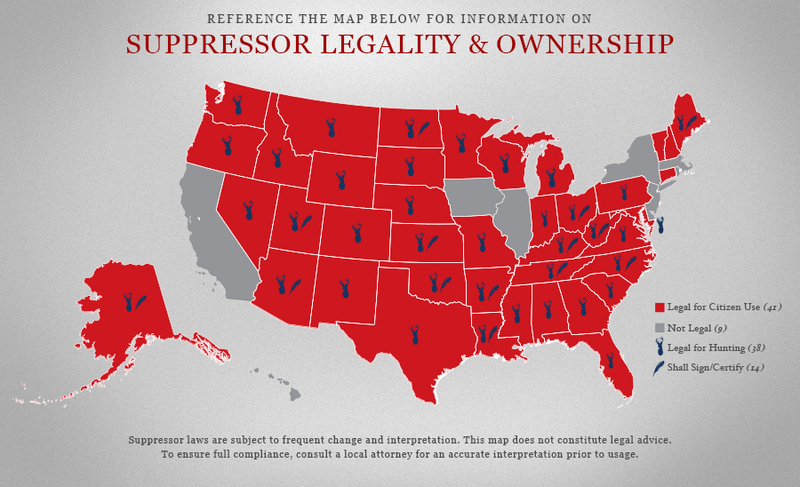 Below is a map from the American Suppressor Association. The best way to own a suppressor is by using a Gun Trust. A gun trust permits multiple users of users of a suppressor as well as permits changes to the authorized users in the future. To find out more about how a gun trust may benefit you or your family, request information on this page. This weekend, I was shocked to read an article on Facebook that was from a popular gun website that instructed people that they did not have to engrave a firearms that they “made” using a Form 1 unless they were going to sell the firearm. This author claims to have asked ATF a question and received a response from an individual who is associated with the ATF. This is equivalent to asking a police officer to interpret the law. Not only do they often make mistakes, but you cannot reply on what they tell you, because they are permitted to lie to you.